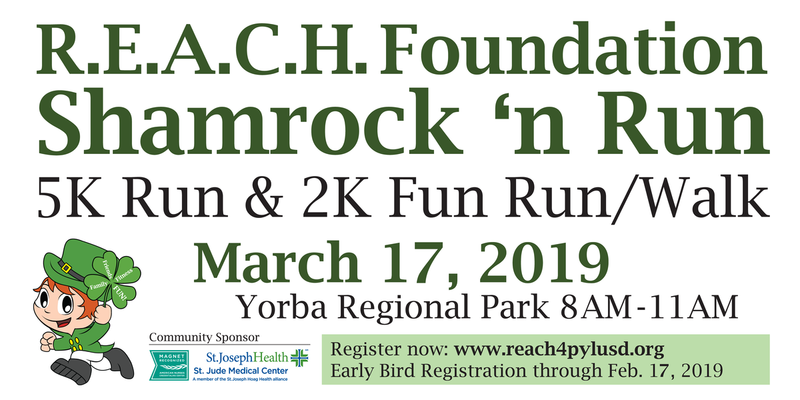 The REACH Foundation's 2019 ShamRock ‘n Run with St. Jude Medical Center benefits the Placentia-Yorba Linda Middle School Track Meet and other REACH Foundation Healthy Lifestyle Initiatives within the Placentia-Yorba Linda Unified School District. This fun community wide event is open to the public. The 5K Run & 2K Fun Run/Walk is Sunday, March 17, 2019 at Yorba Regional Park in Yorba Linda from 8:00 - 11:00 a.m., but if you register by FEB 17, 2019 you will take advantage of our EARLY BIRD REGISTRATION pricing, guarantee your 2019 ShamRock 'n Run shirt size and SAVE! Your online registration fee includes an opportunity to select TUFFREE MIDDLE SCHOOL to receive a $5.00 rebate donation. 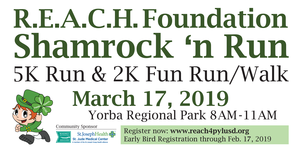 PYLUSD just notched up ShamRock 'n Run Participation Challenge! As an extra incentive, PYLUSD will generously add an extra $1,000.00 to the Unit Budget of the school with the highest percentage of participation based on school enrollment!